Yesterday Astrid and Skagit and I went for a change of pace. 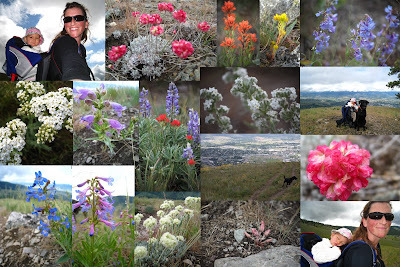 It is easy to get into a pattern of frequenting the same trails on Blue Mountain since it is so close...but yesterday we went up to the top of Sentinel in search of some bitterroots like Sharon and I saw on Waterworks last Friday...there were NOT that many bitterroot pods along the trail - but I saw lots of other beauties to photograph. Astrid got tired of my photographic shenanigans on the way down and finally decided to take a nap. We found every color of the rainbow on the mtn. It was pretty cool.